When today we speak of something being hermetically sealed, we use the name of Hermes Trismegistos, who in a special process cemented and rendered airtight by sealing with clay the Philosopher’s Egg, the vessel in which the transformation of gold was said to take place. As to Hermes, the Legend is not altogether without some histoical support ahhough the story is in the Legend mythical, but of that character which pertains to the historical myth. He was reputed to be the son of Taut or Thoth, whom the Egyptians deified, and placed his image beside those of Osiris and Isis. To him they attributed the invention of letters, as well as of all the sciences, and they esteemed him as the founder of their religious rites. In Ancient Egyptian theology, divine triads were used to express the divine family-unit, usually composed out of Pharaoh (the son) and a divine couple (father & mother), legitimizing his rule as divine king. Pharaoh Akhenaten had introduced a monotheistic triad (exclusive and against all other deities) : Aten, Akhenaten and Nefertiti. In Heliopolis, the original triad was Atum, Shu and Tefnut, in Memphis, Ptah, Sekhmet and Nefertem emerged, whereas Thebes worshipped Amun, Mut and Khonsu. The trinity naturally developed into three or one Ennead. 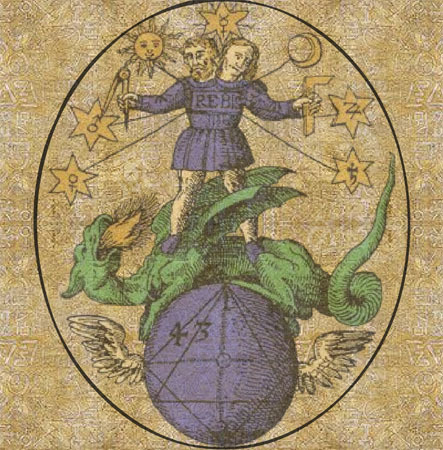 Logos, the “son” from “Nous”, the Begotten One above the Seven Archons – the “Ogdoad”. The One Entity or God (the “Tenth”) is known to Its creation as the One Mind or Hermes which contains the “noetic” root of every individual existing thing (cf. Plato, Spinoza). This Divine Mind (the attributes or names of the nameless God) allows all things to be sympathetic transformations (adaptations, modi) of God. Ancient Greek mythology personified the mysteries of life and the cosmos in the form of a pantheon of gods who ruled from Mount Olympus. Their most powerful god who controlled the sky and weather was named Zeus. Apollo was the son of Zeus and Leto and the twin of the goddess Artemis. He is sometimes personified as the sun driving a fiery chariot across the sky each day. He is associated with the tending of flocks and herds, love of beauty, balance, music, fine arts, poetry and medicine. He is the god of prophecy and is credited with the foundation of the oracle of Delphi. He is usually pictured as a young and handsome man holding the lyre, the bow and arrow, or seated on the omphalos next to the tripod, the twin symbols of Delphi. Hermes, the little brother of Apollo, was personified as Mercury, the planet closest to the sun. The ancient Greek gods were very real to the common man in antiquity, but to the philosophers and to people who could think for themselves, the gods were recognized as metaphors for the powers of nature.